Property For Sale Ireland! 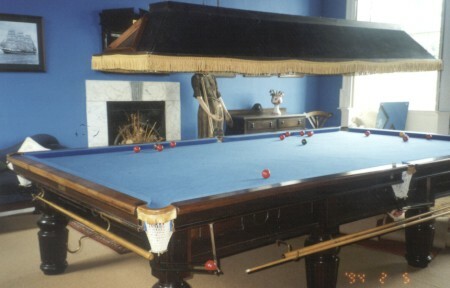 This house for sale in Ireland is offered by owner. 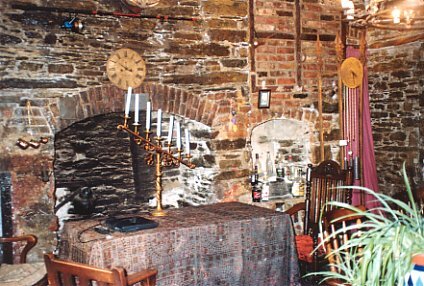 It's a unique period property for sale in Cork. Please Contact Us For Viewing or With Questions! The Sovereign House Kinsale, a unique opportunity to acquire this magnificent Queen Ann Town House dating back to 1706. 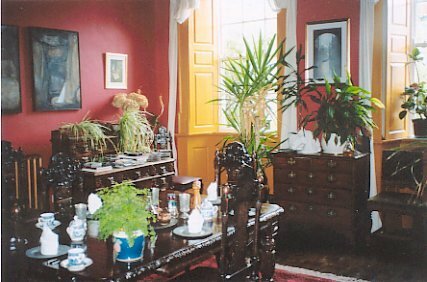 The house is synonymous with Kinsales illustrious history through the centuries to the Millennium, providing period elegance married with modern living conveniences. Sovereign house resides peacefully in the heart of Kinsale town with its internationally acknowledged amenities to hand.This is a house steeped in historical character and charm which must be viewed to be truly comprehended. 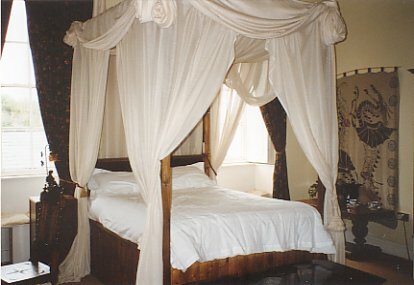 This unique Queen Anne House, "The Sovereign House", offers the most exquisite experience in luxury Bed and Breakfast Guesthouse Accommodation in Kinsale, the gourmet capital of Ireland in picturesque County Cork. 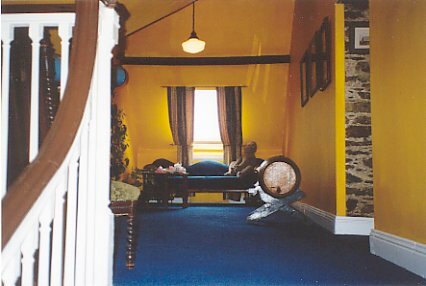 Plumbed for washing machine and dryer, toilet and sink accessed through double doors, carpeted, tongue and groove wall, exposed beams. 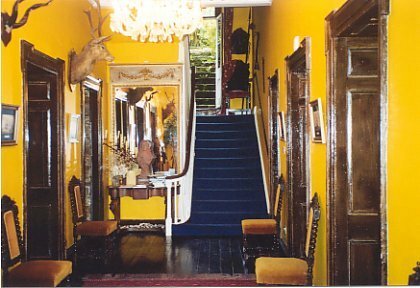 Carpeted stairs to first floor, large glazed French doors to terraced garden on turn in stairs. Bedroom No 1 "Ormond Suite"
Bedroom No 2 "Private Suite"
Carpeted, candle chandelier, cast iron fireplace with original tiled inset, large built in original wardrobe, Georgian windows to rear, French doors to garden area. 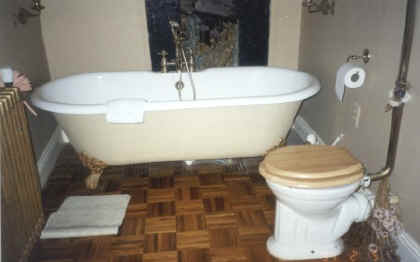 En-suite Bathroom: Double shower with antique style suite and fittings. 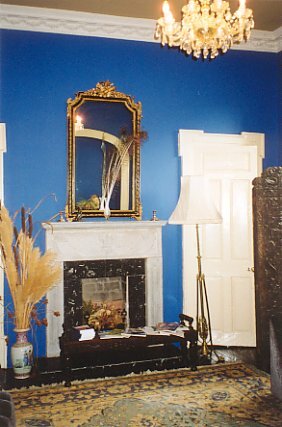 Jacobean style, 8" architrave, Queen Anne style windows, partly stone faced pointed wall, exposed original oak beams fully treated. Attic Area Large open spaced landing. Bedroom No 3 "Desmond Room"
EnSuite Bathroom: Exposed beams cast iron bath with brass fittings, antique style white bathroom suite, radiator. Permission granted to extend the existing velux windows to Queen Anne style to keep the character with the rest of the house, original 13" x 3" oak A beams with Purlin. EnSuite Bathroom: Cast iron bath with brass shampoo fittings, white suite to match antique fittings with characteristic oak punlin. The gardens measure appro. 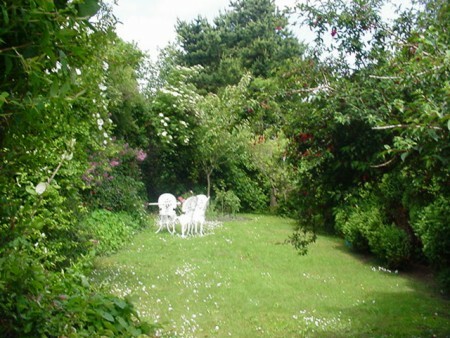 80' x 21', lawned and level amidst an abundance of mature trees and shrubs. To the front of the house, steps lead up to the art Deco gates, bordered by mature shrubs. It was the battle which changed the course of Irish history. The Irish forces were defeated, the nobility fled and the Plantations of Ulster followed, the repercussions of which are clear from Ireland's most recent bloody history. 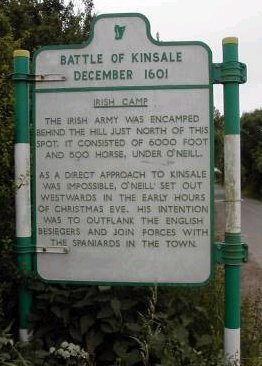 In previous months, troops from Spain led by Don Juan d'Aquila landed in Kinsale despite Irish requests that they land further up the coast. They were surrounded by the crown forces led by Lord Mountjoy. D'Aquila had been promised horses and the support of the whole of Munster but very little of either materialized. In the meantime, 'Red'Hugh O'Donnell, having summoned his troops and local chiefs to Ballymote in Sligo, embarked on a hard journey on foot across mountains and flooded land to Munster and into Innishannon where he met up with the forces of Hugh O'Neill, arriving in Kinsale in late December 1601. Storms and torrential rain foiled Irish plans of a Night time attack. A rare occurrence of St. Elmo's Fire, an electric storm, caused many of the horses in the Irish camp to bolt. O'Neill crossed difficult terrain with a force of 5000 to attack the English camp, but they were ready for them, dispatching them in a bloody skirmish his troops panicked and many fled. O'Donnell's forces were similarly routed and they too gave up the ghost.